I cannot recall seeing an ad for Agnès B or an editorial features which used her clothes in any of the fashion glossies. I imagine these two things are not unrelated, as editorial coverage can depend on the amount a brand spends on advertising in a given magazine. Despite this Agnès B is hugely successful, with a loyal band followers, moi included. The founder Agnès B was born Agnes Troublé in Versailles in 1941. The B comes from her first husband’s surname. She opened her first store in a converted butcher’s shop on the Rue du Jour in Paris in the seventies. According to the company’s website there are now 246 stores worldwide. I look on Agnès B shops as semi-magical places where there are lots of clothes that I would love to buy and wear and wear. The clothes are: chic, stylish, understated and timeless. There are edgier items for the younger set. It is not unusual to see mother and daughter combos shopping in Agnès B. The staff are good. They are enthusiastic about the brand, knowledgeable about its origins and are happy to show you a different way to wear something. The label’s dedication to quality is obvious. The company prides itself on the fact that much of the collection is still made in France, preserving jobs and skills. On a high street where the ethics of some of the retail giants are open to question, Agnès B stands out as a brand that is deeply committed to corporate social responsibility. Top tip; If you are in an Agnès B shop don’t, as I did, pick up the cutely packed small items in glasses vases, on the counters beside the tills and wonder aloud what they are – they are condoms and Agnès B gives them away for free! 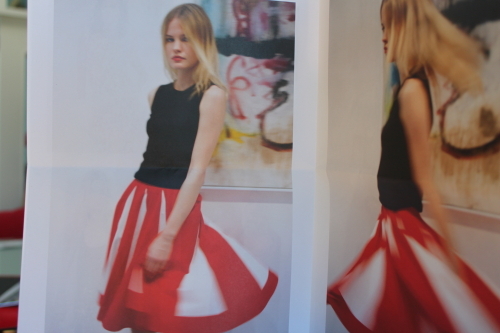 Note: There is a no photographs policy in Agnès B shops so I shot the above images from a S/S 2011 brochure. I do like Agnes B, and was thinking of calling in at the shop in London. Thanks for the warning about the photography – I’ve been warned before, but I always forget. I enjoyed reading about your peregrinations, views and helpful hints to make life a better one. Like you, I must admit that I am a Francophile. When we go to Paris we stay with our friend C in Pigale and how I wish I could spend the rest of my life wandeirng around les petites ruelles, with everything en saison at hand, but then again, Catherine would love to live in D. Are we ever satisfied with our lot! I loved Fleure’s water pearls, so different to the usual white beautiful but so symmetrical rows we all have in our jewellery boxes. Speaking of Pearl, my new Siamese chocolate point kitten is called Pearl! I’ll definitely try the delicious lamp dish, am always on the look-out for new receipes. The Nepalese note paper is so Eastern, minimalist and fragile, I am sure it is a joy to write on. I strated out doodling many years ago during boring Teleconferences with European pharmaceutical companies, waiting to dial up or waiting until the Italians had finished their spats, and before the year was out I had the makings of a book which I later self-published, so you never know, you might one day do the same. Must try a glass of bubbly in the Ritz la prochaine fois I am in Paris. I really enjoyed reading your comment. Thanks for taking the time to leave it.